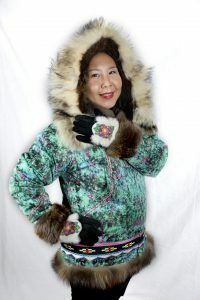 Marissa Rankin is showcasing her parka from the Nome area made by Easter Henry featuring wolverine/wolf ruff and her beautiful beaded and fur gloves from Bethel. Alaska Native heritage and culture is celebrated at Southcentral Foundation every day, but in November, the entire nation observes American Indian and Alaska Native Heritage Month. SCF was one of many local organizations offering activities in celebration, including professional photography for regalia, open beading events, and social media promotions, to name a few. SCF continues to expand and include more cultures and celebrations related to not only the people SCF serves, but also its diverse employees. www.southcentralfoundation.com/native-heritage-month and submit your ideas.